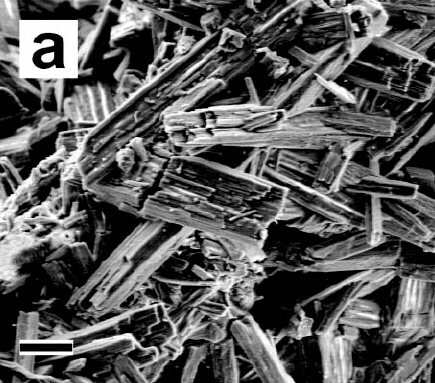 Comments: Scanning electron micrographs of nesquehonite clusters showing the typical elongated habit. (AmMin, 88:1882). Location: Crystals associated with the remains of a saguaro, Carnegiea gigantea from south and west central Arizona. Scale: Scale Bar 50 µ-m (lower left).